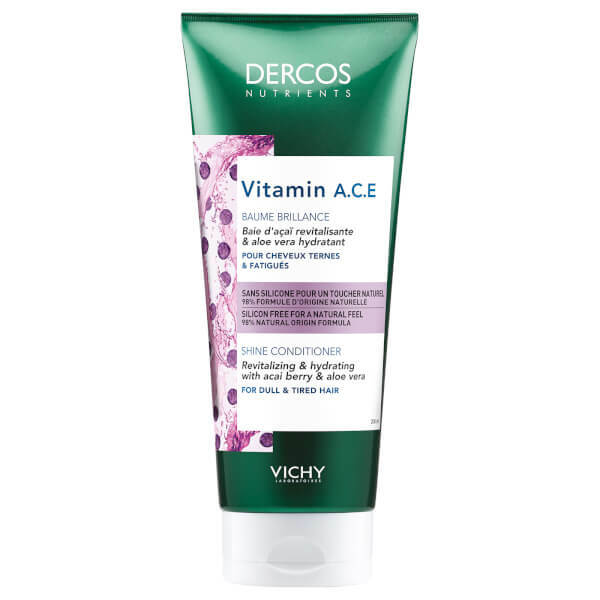 Bring dull hair back to life with Vichy Dercos Nutrients Vitamin A.C.E Conditioner, an intensive treatment that infuses locks with smoothness and shine. A potent blend of Aloe Vera, Acai Berry and the brand’s own Mineralizing Thermal Water works to replenish high levels of moisture and nutrients to smooth the hair cuticle and minimise frizz. Vitamins A, C and E help to restore a healthy balance to the hair and scalp, resulting in a healthy and radiant finish. Wash hair with hydrating shampoo. 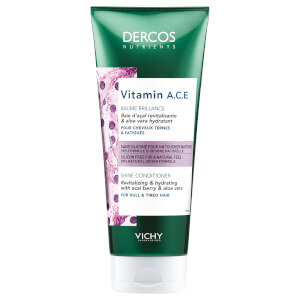 We recommend Vitamin A.C.E Shampoo. Apply a small amount of Vitamin A.C.E Conditioner form roots to ends and leave for a few minutes. Rinse hair thoroughly and towel dry before styling. 1144794 H, Aqua/ Water, Cetearyl Alcohol, Helianthus Annuus Seed Oil/ Sunflower Seed Oil, Glycerin, Strearamidopropyl Dimethylamine, Cetyl Esters, Parfum/ Fragrance, Aloe Barbadensis Leaf Juice Powder, Ascorbyl Glucoside, Caprylyl Glycol, Carrageenan, CI 75130 / Beta-Carotene, Citral, Euterpe Oleracea Fruit Extract, Glyceryl Stearate, Glycine Soja Oil / Soybean Oil, Limonene, Maltodextrin, Sodium Benzoate, Tartaric Acid, Tocopherol.